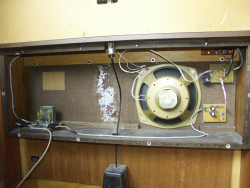 The Free Wurli project is an alternative to refurbishing or buying a ready made replacement board for all Wurlitzer e-pianos. Open source project: Free Wurli is indeed an open source project. You can download the schematic, the components list and the PCB, and you can modify them all by installing the freeware version of the PCB software "Eagle" by CadSoft Computer GmbH. The only restriction is that if you build another project that is based on Free Wurli, you must publish at least the schematics as I did. If you have any other ideas, please let me know - I would be delighted to mention them here. Cheap and easy to get components: All the components used for Free Wurli are easy to get all around the world. This means you don't have to worry where to get exotic components from. I also tried to design the circuit in a way that many components have the same value - this way you can buy a cheaper multi pack. Versatile PCB board: In many PCB kits you have the problem that you must use components with exactly the same inter-lead spacing the creator used. This is particularly problematic with capacitors. The Free Wurli PCB is prepared to hold capacitors with various inter-lead spacings. Hence you find the original value plus alternatives in the component list. The PCB provides alternative drill holes for most capacitors. No special transformer needed: One real problem is to get a replacement for the transformer in case it's blown up. The original transformer has a winding for the low power part of the amp and one for the high voltage supply of the pickup - this means it's a very specialized transformer that you probably won't get easy. With the Free Wulri circuit you can get rid of this exotic transformer and buy a simple 2x12 V transformer for little money. The patented circuit used in the power supply generates high voltage from 12V. Effect loop/line out: Just in case you want to use your piano with a PA or would like to use an EQ or any other external device - Free Wurli includes an effect loop that can also be used as line out. 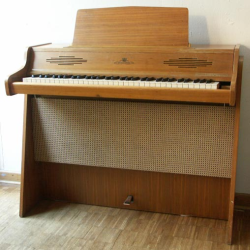 Optional tremolo: Free Wurli includes a tremolo oscilating with the frequency of the 200A model (7Hz). 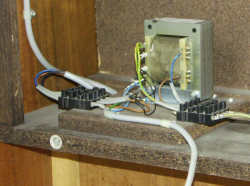 In case you don't want the tremolo, just leave out a couple of components and you have a Wurli without a tremolo. 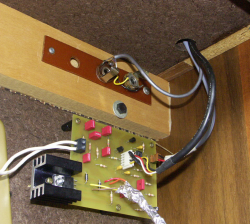 Easy to build: Free Wurli uses two boards - one for the power supply and one for the amp (including the tremolo). The reason for this is mainly that the freeware version of the PCB software "Eagle" is limited to boards of 100 x 80 mm (4 x 3.2 inches). 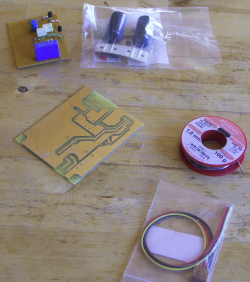 However, building and testing small boards is often perceived to be easier especially for the unexperienced. Please remeber that Wurlitzer e-pianos are not manufactured anymore. I think that Wurlis will soon be considered historic instruments. So please, please, please don't drill holes, loose the original volume knobs or change anything that can't be reversed and thus reduces the value of your instrument. "Chopping" your piano (cutting off the legs) is another thing that I don't appreciate at all. After all the things I have tried to get rid of the anoying hum, my conclusion is that hum is in he nature of the Wurlitzer pickup. This means I could not completely remove the source of hum - since shielding the whole pickup unit is impossible due to the piano action. However I recommend to line the whole cover with a conductive material and ground this shield. Another measure in the circuit was to reduce the amplification factor of the preamp to get a better proportion between hum and the actual audio signal. Moreover you should use a shielded cable as connection between the two boards and connect the shield with the ground. That way the remaining hum is absolutely acceptable. If you want absolute silence you could be filter it out using equalizers or special hum filters in the effect loop. 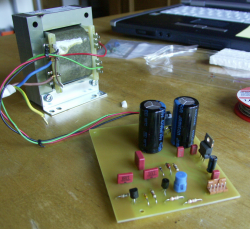 The high voltage unit: The high voltage power supply uses an inductor to generate the high voltage from a 12V source. Through this coil flows a current that is turned on/off 50.000 times per second. The high voltage is generated through self-induction and then limited by the zener diode to 150V. The low power circuit: The low power voltage unit is a very common circuit. For the supply of the tremolo and the preamp a typical voltage regulator IC is used. For the power amp the volatge coming directly from the rectifier is used. The preamp: The Preamp is built with a low noise and high impedance IC. This curcuit is also very common. The circuit is protected from the high voltage via C1 by filtering out the DC part and only leaving the AC part through (which is the audio signal to be amplified). The tremolo: The tremolo uses a FET transistor that acts as a variable resistor parallel to R7. The source connector of this FET is powered by a sinus oscialtor that is build using a phase shifter arround T2. 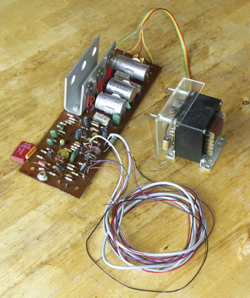 The circuit only allows to alternate the depth of the tremolo just like the original Wurlitzer circuit. You can modify the speed of the tremolo by changing the value of R17. The effect loop: I have built in an effect loop, where the send-jack also acts as a line out interface. The volume control does not change the line out signal since I think it is up to the sound engineer to mix the whole ensemble. The player himself can only adjust the loudness of the speakers independently. The power amp: The power amp is build using a very common HiFi power operational amplifier - the TDA2030. Its output in this circuit is about 12 Watts at 4 Ohms or 8 Watts at 4 Ohms. This is enough to let your neighbours enjoy your playing. For more output power, use the line-out and an external amp. To be honest, I never found out the original amp's output and how much the speakers can stand. I just heard rumors that it was 30 Watts. I strongly recommend to order the PCB rather than try to create it yourself - the quality is just much better. Using http://www.pcb-pool.com was a good experience for me. Let me know if you can recommend other service providers around PCBs. The service provider must accept EAGLE files. The project file you can download was created with EAGLE version 5.2. In case there's a new version of EAGLE available, you can download version 5.2 here. Soldering the components is straight forward. Start with the resistors, continue with the capacitors and solder the ICs last. The power amp IC needs a heat sink - with a Rth of 4.2°C/W you are on the safe side. The really annoing thing in PCB kits is not the components but soldering all the cables and the hardware. It took me twice as long as soldering the components. I advocate pre-crimped leads and connector terminal blocks for connecting the two boards with all the external hardware. One very important hint: Use the best quality you can get for hardware parts such as resistor potentiometers and jacks. Cheap hardware means trouble sooner or later. After you have assembled everything it is time to mount the boards and the hardware into your piano. 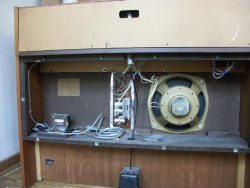 In my Wurlitzer 300 there is plenty of space for the boards and the amp. In other models you should think about mounting the two boards and the heat sink on a wooden board which has exactly the same size and mountig holes as the original board. Since the heat sink has a much lower height than the original heatsink, you can then easily mount the whole unit instead of the original board. 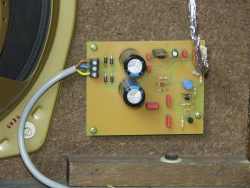 Should you build the amp yourself or buy it from...? I know about the following vendors of replacement amps: Vintage Vibe (US), Speakeasy (US), Taste und Technik (DE), Electronic Piano Service (NL), Vintage Music Parts (PT) - let me know if you know more. To provide a replacement board these professional vendors must obtain all the parts, manufacture the PCB, shipp it all to the customers, provide warranty and mess around with customers that are not willing to pay - not to mention the cost of developing such a circuit. So I guess nobody is getting rich with replacement boards considering the prices I have seen so far. At this point I would like to state that a professional replacement board is definitely worth its money. It took me a lot of time and money to analyze the original circuit, experiment with a number of alternative circuits, develop prototypes (and believe me, I had plenty of unsuccessful trials), design the PCB for the final circuit and publish this report. However, the Free Wurli way will cost you about 120 Euro (60 for the two PCBs, 40 for the parts and 20 for the transformer) plus: time. Another question is how experienced you are with a soldering iron and electronics. You might find a friend who can assist you (or a youngster in the neigbourhood that will do that for a new skateboard). So it's up to you whether you purchase a board from a professional vendor or better try the do-it-yourself solution described here. Please help the Wurli community by sharing your comments, your ideas for improvements, your experience and your pictures around Free Wurli. I will publish them here. Please send it to me: sascha.kerschhofer@googlemail.com - thanks. And here it comes: Please consider that since this amp is powered electrically by high voltage it should only be handled by a qualified person. I take no liability for damages caused by these instructions or the circuit. Whatever you do with these instructions, you do it at your own risk.